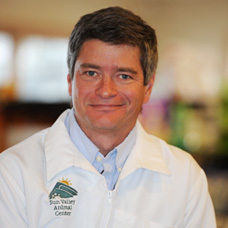 Our experienced veterinarian, Dr. Scott Acker, received a Bachelor of Science Degree in 1985 and his Doctorate in Veterinary Medicine in 1990 from Colorado State University. Following graduation, Dr. Scott Acker was accepted by the West Los Angeles Veterinary Medical Group for a one-year internship in small animal medicine and surgery. Dr. Scott Acker spent the following two years at a private practice in Santa Barbara, CA. Dr. Scott Acker came to Sun Valley in 1993 and is happy to call this area home. Dr. Scott Acker’s special interests include veterinary internal medicine, laparoscopic surgery, and veterinary ultrasound. Outside the hospital, Dr. Acker enjoys trail running, mountain biking, hiking, and skiing.